If you're looking for a way to incorporate color into a drab work wardrobe-at least temporarily--or you're interested in finding a new way to add a pop of color to your more casual weekend wear, women's colorful rain boots are a way to do it. You can find them in all types of stores and within most price ranges, so you can opt for designer if you feel up to the splurge or you can keep it cheap by shopping at a store like Target. 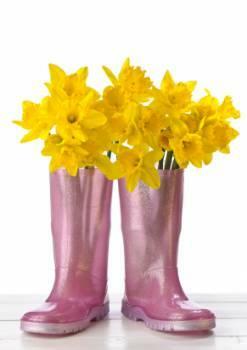 As mentioned earlier, you can spice up any type of outfit with your fun, colorful rain boots. Even if you're required to wear something somewhat serious while you're at work, there's nothing that says you can't show off a fun, quirky facet of your personality while you're on your way there and back. There's a good chance you already have at least a few pairs of neutral shoes in your closet. Since rain boots aren't meant to be worn all day, they can be something unexpected. Just carry your black pumps with you and switch them out at the office. On the weekend, you may be dying to wear some cute, strappy sandals, but alas, the rain had the perfect timing to ruin your plans. At least a feel-good fallback is a pair of unexpected, colorful boots. If you can't wear your amazing new sandals, the least you can do is buy yourself a pair of eye-catching boots to make up for not being able to show off your pedicure. Muck Boots Online: Here, you can find waterproof fuchsia boots; brightly colored patterns like bohemian, daisy, hearts, and more; and even boots with a neutral base and splashes of color, like the brown Atrium Maude Rain Boots that feature purple accents. They're designed to be comfortable and slip-proof, so you draw attention to yourself with the colors, not a fall. Target: Ah, Target. This is one store you can usually count on to have fun shoes at inexpensive prices. When it comes to rain boots, they still don't disappoint, and you may even be able to get away with avoiding shipping charges if your local Target happens to have the style you want in stock. Most of the boots run about $25, so you won't even have to pay much to get the great style you want. If you're a girly-girl at heart, be sure to check out the Dots Spots rain boots in Light Berry. If you prefer a look that's classic yet still colorful, you can't go wrong with the Zulima Bias Plaid rain boots in Multicolor. One of the perks to shopping online at Target.com is the customer reviews section. If a boot won't be comfortable after a little while, you may be able to find out ahead of time and spare yourself the pain and disappointment by looking through the ratings and feedback. The bottom line is if you have to wear rain boots, why not make them fun? Women's colorful rain boots are available all over, so add a bright side to the dreary weather by picking up a pair or two.